Francis Cheevers was a son of John and Sarah Cheevers of Cookstown. 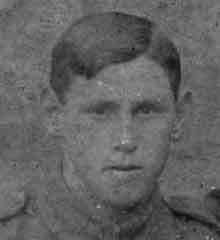 The family lived for a time in Killyleagh, County Down, and Francis enlisted in Downpatrick, joining the 13th Battalion Royal Irish Rifles. The 13th Battalion was raised from the ranks of the County Down Volunteers in September 1914, and after training at Clandeboye and Seaford, landed at Boulogne in October 1915. Preparations were under way for the Somme Offensive. He was killed as he attempted to cross ‘No Man’s Land’ on the morning of 1st July 1916, he has no known grave and is commemorated on panel 15A-15B on the Thiepval Memorial.